In preparation for my Mt Kota Kinabalu hike in March. 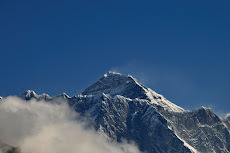 I decided to go for an endurance trekking exercise. At the same time, I was trying to acquire as much needed pictures for LK from RMBR. 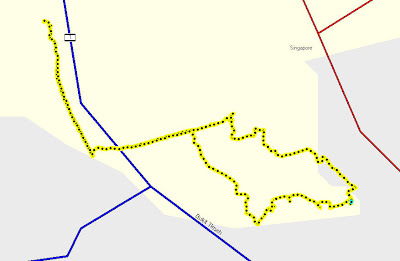 The endurnace trekking starts from my place, into Zhenghua Partk, towards the Pipeline Reserve, and into Rfile Range Road. At the end of Rifle Range Road is a track leading to McRitchie Reservoir. Along the way, one will pass the Jelutong Tower, and then into surrounding area of SICC. Once at McRitchie carpark, continue the journey to the Kayaking station, and onto Venus Drive to the HSBC Tree Top Walk and then back to Rifle Range Road. In total, this journey will be 24 km long and will take about 6 to 7 hours to complete. 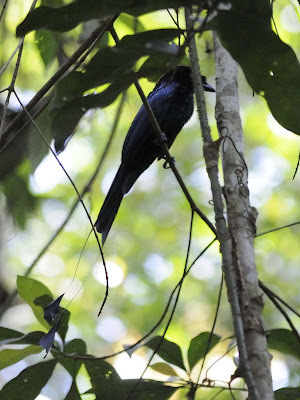 Time 08:30 hrs – Lining the Pipeline Reserve are the Rain Trees (Samanea saman). This tree was introduced into Singapore in 1876 from South America. This tree offers much shade as its canopy covers large areas. At this hour, the birds were very active. Unfortunately most of them were simply too fast for me to capture with my camera. A flock of green Bee-eaters were flying about, but the most acrobatic of them all was the Pacific Swallow (Hirondo tahitica). 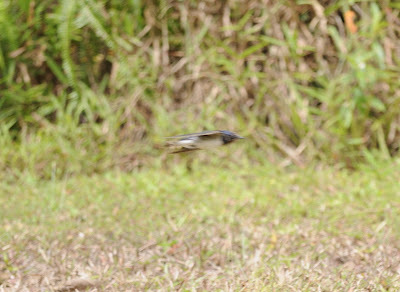 Pacific Swallow involves in aerial acrobat as that is how they catch their insect meals. Unlike swift, swallows tend to catch the insects near to the ground. Despite the fact that I was using speed of 1/1000 sec, I was still not able to freeze them in action. 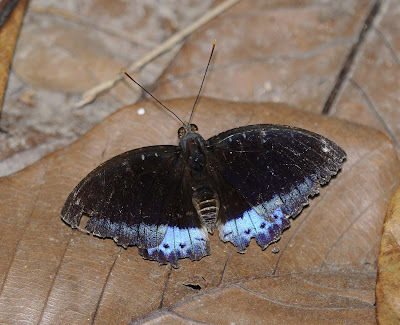 This Pacific Swalow was taken near the SICC - it just caught an insect and decided to rest on this sign. Could not miss the opportunity for some closed up. Along the Pipeline Reserve, there were many spider webs glistening in the morning dew. Took this shot of this yelow flower with a drop of dew on the blade of grass. I called it Awakening! When I was doing my National Service, the instructor always tell us "never stand in the skylight", for you can be easily seen. Well this Collared Kingfisher (Halcyon chloris) made that mistake, and provide me with the opportunity to take couple of "shots". This unknown bird perched on a tree with no foliage, which is a delight to people like me who cannot wait to get a few shots of them. 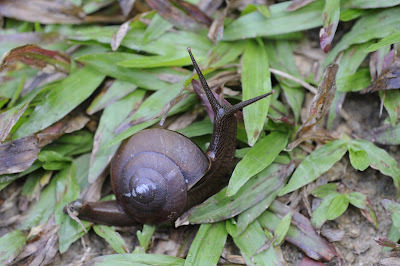 This Land Snail (ID unknown) was also out foraging for food. This is unlike the common Giant African Snail, to me this specimen is better looking than the Giant African Snail. Time 10:30 am - At this hour, the birds decided to hide. One can notice that the ambience sound is now lacking in birds'call! The insects at this time were not very active. 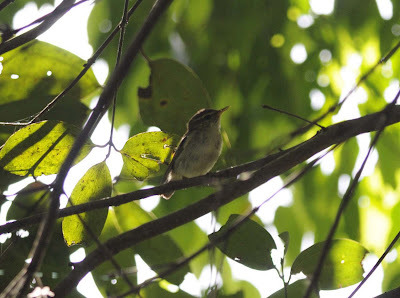 Occasionally, one will chance upon some of the birds that were hiding in the foliage. 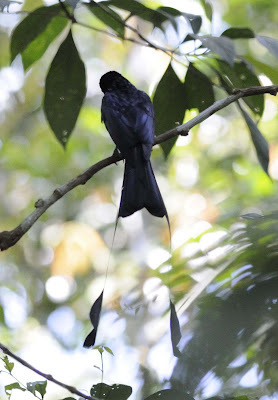 Like this Great racket-tailed Drongo (Dicrurus paradiseus). In this shy posture, I can only take its back. Notice the tail plumage - it is elongated with a tuft at the end. Another angle of this shy individual. It has red eyes, and can mimic the calls of other birds. Feed mainly on insects, it is actual quite easily spotted as it tends to make very "cheerful"noise in the foliage. I managed to spot a number of them by locating their calls. In another tree, I spotted this individual. Not too sure about its ID. Time 12:00 Noon - I arrive in McRitchie. Half way in my trek, and I was already quite tired. (Must be the heat). In the water, I noticed these pond skaters. They were in the hundreds. Not too sure why they were congregating in this spot! At this hour, the insects and the reptilian animals were now most active. Cicada noise fills the air, and butterflies were everywere. This skink was sunning itself when I accidentally scared it, and it scurried into the undergrowth. Looking at the belly, you will notice that it is golden in colour. This is the Many lined or Common Sun Skink (Mabuya multifasciata). Skink has smooth scaly skins and is diurnal (active in the day). Time 15:00 Hr - Having looped round McRitchie, I was on my way to the Treetop walk, and noticed many rattan. Rattan comes in many size, and the most obvious trait will be the barbs. They have different design, and this type of rattan tends to be a "creeper", and the barbs (thorns) help in the process of creeping up. But woe to the person who accidentally brushes into one of them, the only way to unhook is to move backward. And copying the design from the rattan, man has build barbs around these pipelines. I used to walk on top of these pipelines, just to cross from one point to the other. Now it is no longer possible. Time 15:30 hr - At the tree top walk, I met a fellow nature lover who has vast knowledge on plants. He explained to me many plants and its flowers and leaves. I was most appreciative, and he told me he was looking for Tongkat Ali. Then he found it, and showed me the Tongkat Ali (Eurycoma longifolia). Most of us are familiar with the roots, but not the complete tree. Tongkat Ali is an aphrodiasac use in this part of the world. It is extremely bitter, and occasionally people will mix it with honey before partaking it. Time 16:30 hr - Finally I reached home. My legs were sored and my feet hurt. But it was worth it. Now I wonder whether my Semakau kakis and Climbing Crabs kakis are interested in this endurance walk!